Our studies are currently focused on the five inner membrane complexes of the oxidative phosphorylation system (OXPHOS complexes) inclusive the F1FO ATP synthase. The disclosure of their organization in space (micro-compartmentation, supercomplex formation) and time requires establishing and implementing novel biophysical and biochemical tools. The relative arrangement of the OXPHOS complexes to each other is probably the key to their function, adaption, and coupling, resulting in measurable parameters like mitochondrial membrane-potential, ATP and NAD+/NADH levels and ROS (reactive oxygen species) production. Thus, our main aim is to dissect the spatio-temporal assembly of OXPHOS (super-) complexes on the molecular level. Furthermore, the impact of mitochondrial ultra-structure and dynamics on OXPHOS functionality and mitochondrial performance is determined. These analysis’ are performed in the context of mitochondrial dynamics and mitochondrial quality control. The failure of mitochondria is closely associated with the development and progression of certain neuro-degenerative diseases. To understand this in more detail, we dissect the organization of the respiratory chain complexes in neural cells under variable conditions. 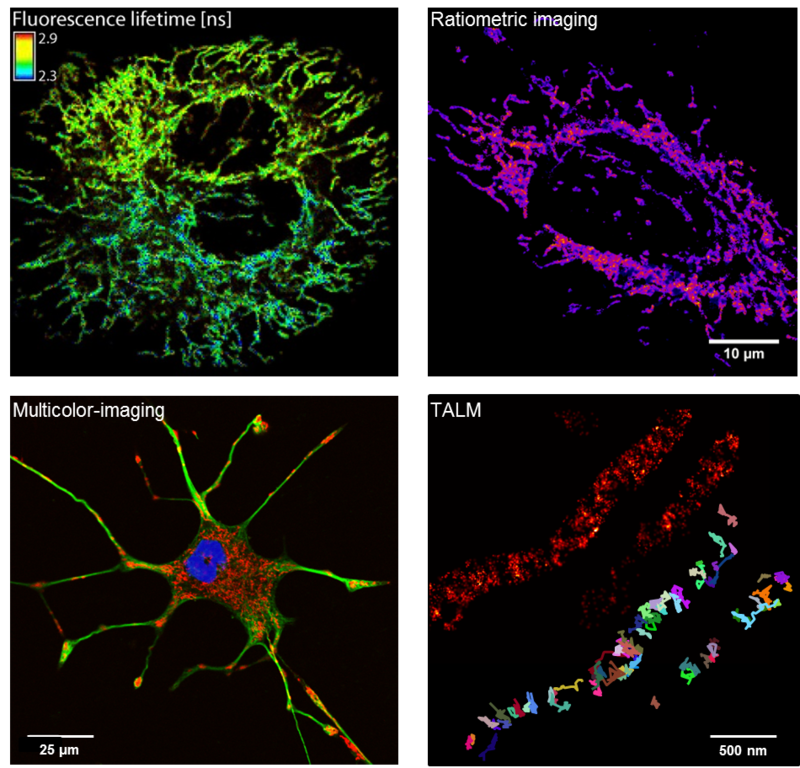 We use high and superresolution live cell microscopy to study protein-protein interactions and spatio-temporal dynamics of mitochondrial OXPHOS complexes.